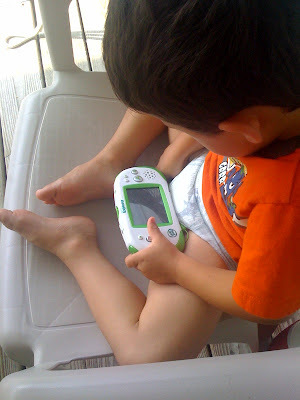 My son recently received the Leapster Explorer from LeapFrog to see what he thought. We have owned many Leapster devices in the past that we were pleased with so I could not wait to see how this one would compare. It was no surprise that the Explorer did not disappoint, as a matter of fact it exceeded my expectations!!! Kids can keep busy playing and learning by playing cartridge games and by downloading "apps" into it. Right now my sons favorite cartridge game is Mr. Pencil Saves Doodleburg, this games allows kids to practice drawing lines shapes, printing letters, creating art and animations. He also really likes the "app" Harmonies which allows him to conduct four singers while learning about harmonies and musical parts. For even more fun you can also download e-books from the Tag library. I really like the size of this gaming system, besides being great for home play it is also convenient to take on the go. It would be great to kept kids entertained on long car rides this summer! The graphics are very good on the Leapster Explorer. It uses Flash for great visual performance and a Linux-based operating system. The screen is large , bright , full-color and touch sensitive . It has internal memory of 512 MB and a download capacity of 250 - 300 MB. It has plenty of storage for gaming FUN! The Leapster Explorer will be ready for pre-order on June 7th, 2010. It will be on shelves July 15th. It will be available in pink or green for $69.99. Cartridges will be around $24.99. A pack of two Leapster Explorer Leaplet Learning App Download Cards is $14.99. Coming soon will be a Leapster Explorer Camera which will snap into a peripheral slot. It will be available around October 2010, giving kids the ability to take and customize videos and photos. It will retail for $24.99. Win a Leapster Explorer to be DELIVERED to your door the day it hits shelves on July 15th! Visit the website and check out the Leapster Explorer and tell us what game/app/video/etc you would like for it! One winner will be chosen ! I will be using a random number generator to select the winner. Contest ends at 11:59pm CST on 6/28/10. If the prize is not claimed in 48 hours a new winner will be chosen.Contest open to U.S. residents only. My son wants toy story 3 games. My son would like the sponge bob squarepants fists of foam game. Thanks for the chance. I would get my daughter the Star Wars: The Clone Wars game for the Leapster Explorer. The Disney Princess Pop Up Story Adventure would be perfect for my God-daughter. I love that it encourages reading and learning about music. I would love this for my daughter! I think she'd LOVE the Toy Story 3 game or the Disney Princess Pop Up Story Adventure!!! My boys would love the Ben 10 game! I Leapster Explorer is great love the touchscrren, the ability to track their progress, and e-books for my son who loves to read for hours at a time. I'm also in the house of blue, 3 boys and hubby. Tristan would like the SpongeBob SquarePants Fists of Foam game. I like the Disney Princess Pop up adventure!! I like that it turns into a camera. I would love to download Dora's Worldwide rescue (among lots of other games that is). Part of our old Leapster's screen died on us so we can't play it anymore and with 3 kids I would LOVE to win this Explorer. Thanks for the chance! My granddaughter would love to have Dora the Explorer: Dora's Worldwide Rescue to play. I would like the Toy Story 3 game for my child. We would really like the : Disney • Pixar Toy Story 3 game for my son, and the Flash card : Spanish for my daughter! Emma will insist on Dora's Worldwide Rescue! My son would love the Toy Story 3 game. The Toy Story 3 Game! I would like the NFLRush Zone. My son really loves math. We'd love Jewel Train. How fun! I would like the Disney Princess Pop-Up Story Adventure for the Explorer because my granddaughter loves the princesses! My favorite feature is that it turns into a camera! How cool is that? I'm looking forward to the Toy Story 3 game. My favorite aspect is the camera function! The kids would love that. Thanks for the chance to win! I would love the Toy Story 3 game! Our favorite game would be the Globe: Earth Adventures geography game. I'd get the Dora's Worldwide Rescue game to go with it. My grandson would love to play the Toy Story 3 games! My daughter loves Dora so the Dora the Explorer: Dora's Worldwide Rescue would be the pick. going to try to add your button to my blog...if i can figure it out..wish me luck!